When walking by our big window, I noticed the cat notice some back-yard birds. She rushed to the window sill and crouches for the attack. Pretty sure, she forgot about that thing called glass. I laughed at her and then looked to see what visitors we had. And there he/she sat. All prim and proper in the holly bush. For this post and lack of bird anatomy, I will call her she. As SHE was very dainty, and soft. She seemed to enjoy the soft rain. I wanted to go get my camera, but I knew as soon as I did she would fly off. It’s been raining here. And when, I walk from the office to the kitchen. There she is. Enjoying the rain. I didn’t see her get throaty or sing-song. She seemed fairly quiet for a mockingbird. She didn’t seem to mind when the dogs were let out or I peeked at her from the window. I made a Bob-White whistle and she dove into the bushes. Only to emerge after checking to see if the coast was clear. I guess she met one too many of those fellas. So this was our rainy day excitement. A little Northern Mockingbird visit. As you can see from my earlier post, we are happily rocking the spring here in North Central Texas (Dallas/Fort Worth area). And although we have had a few unusually cold nights, all in all, we are having a fabulous spring. Much cooler and longer than any previous years. I guess the season is taking its time to move on (just like stubborn winter!). But you know? I love this time of year. Not quite as much as I love Fall, but almost. One of the first blooms to make their appearance in the spring are the wild clover. They pop up in the yard just before the first mow of the new season. I blogged about them in Spring of 2011 (also a weekly photo challenge) right in this post here. See? I told you I loved them and so does my sweet pup. In the meantime, frozen in time before their untimely trim. My gorgeous yard clover captured with my most favorite Nikon. Aren’t they beautiful? I love how they kick off spring with such pop and flair. This post is part of the Weekly Photo Challenge by the good people at The Daily Post on WordPress. I love their weekly challenges and inspiration. Please stop by and see other entries. Maybe, just maybe, you will be inspired to enter your own. I would love to see if you do, leave me a comment so I can stop by. I went to the zoo. 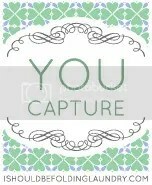 I got lots and lots of pretty pictures. 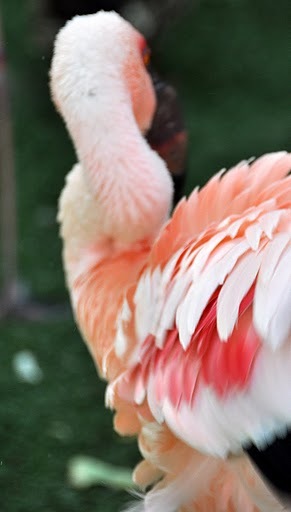 It was my first visit to the zoo with a DSLR camera. 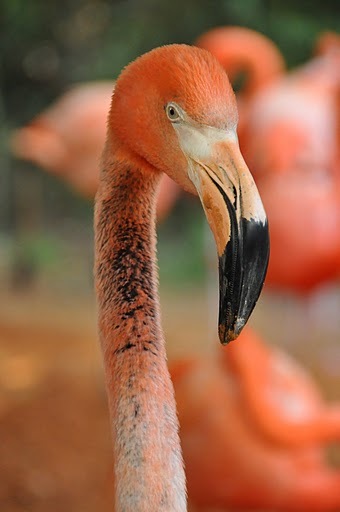 It was my first visit to the zoo after three digital photography classes. 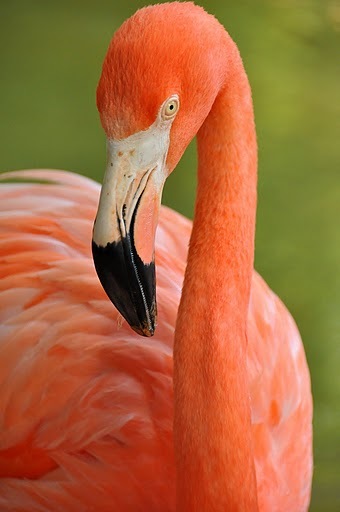 I think it was my first trip to the zoo that I really found the beauty of the animals. It wasn’t about the display or how real it looked. It was about so much more than their pen and their antics. I saw colors and shapes, reflections and texture. I saw lighting, profiles, and eyelashes. Details I hadn’t seen before and I realized….there are a LOT of birds at the zoo every animal is a great capture. 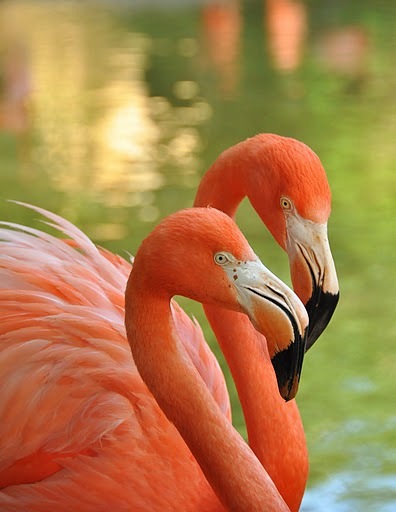 This week You Capture from my idol Beth Fletcher has gone pink and pink is sooo sooo lovely. I have girls. Three of them. 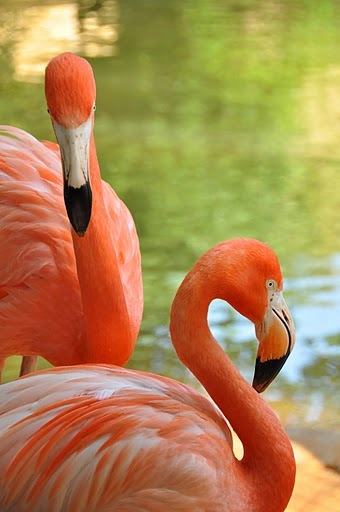 We LOVE pink! 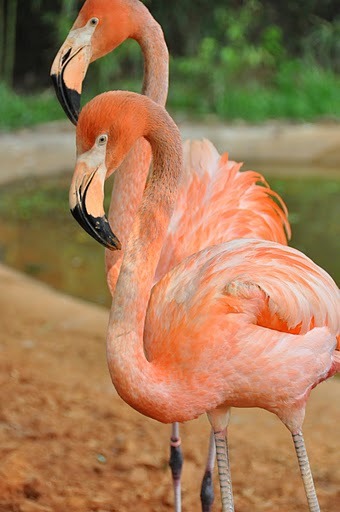 I am sharing my photographs from the zoo. These are the ladies (and gents) that – I think – wear pink the best. 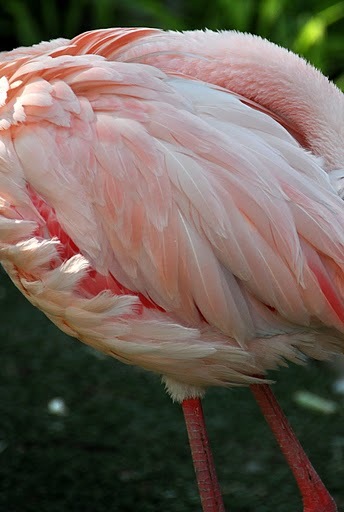 I have many more photographs from the zoo, but for now I’ll leave you feeling pink. 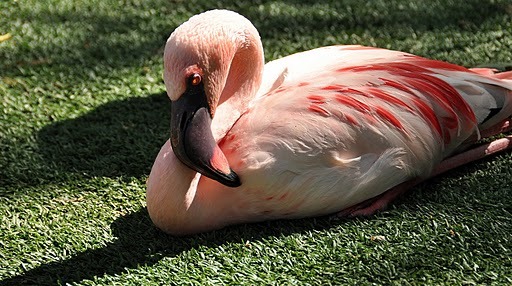 Lucky for me, I have ANOTHER field trip to the zoo for photography class this weekend. 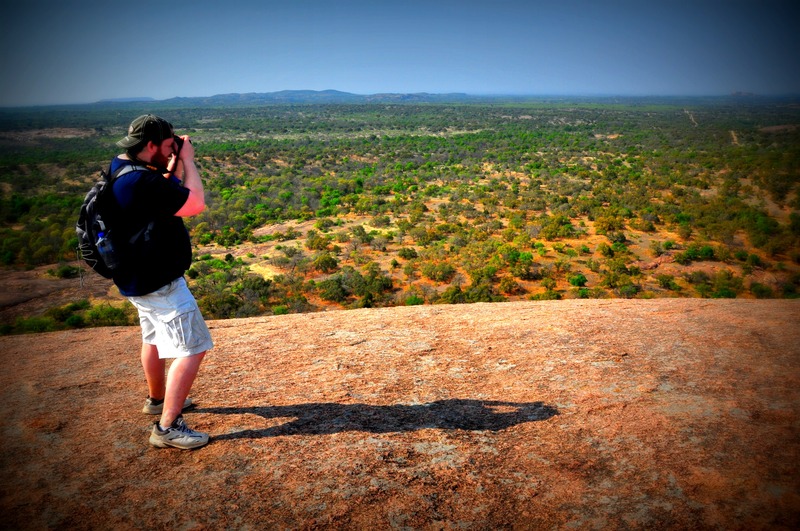 With the start of another class – Wildlife Photography – I am excited to get to clicking. 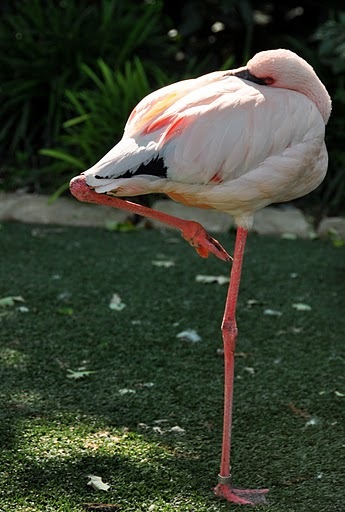 It is amazing how different a trip to the zoo is when you are looking through a viewfinder. Also this weekend, we are celebrating a brand new seven-year old’s birthday at the movies and having an all-girl sleepover with her cousins. Molly turned the lucky seven this week! I think we’ll have lots of pink and lots of fun. I can’t think of a better way to do it than with family that lives close, and girl cousins close in age. Funny thing is? Jason will be outnumbered by a ratio of 10:1 (if you include dogs). He will need a poker night after this. Ha. Have you been to the zoo lately? 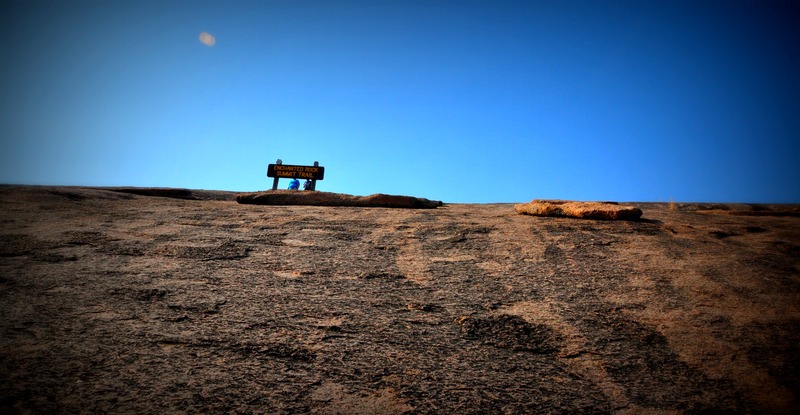 Enchanted Rock – 1,825ft – a pink granite wonder located in the Texas hill country. The climb is a steep 425 foot rise in about a half a mile. And to a non-math, non-physics, non-calc type person like me; it doesn’t mean much from the bottom. Except…..
Is that an ant or a person up there? So, I wasn’t concerned. I was excited! Look at the picture again. TONS of people are climbing the summit trail. It can’t be THAT bad, right? 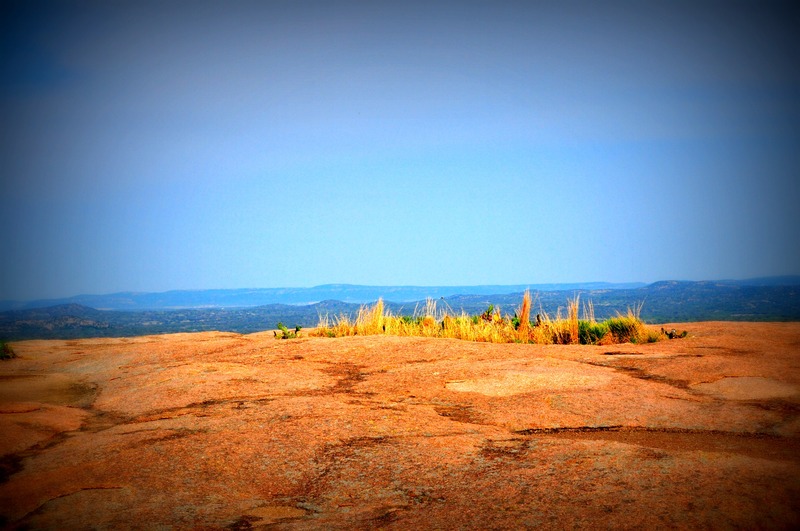 Enchanted Rock State Natural area consists of 640 acres. 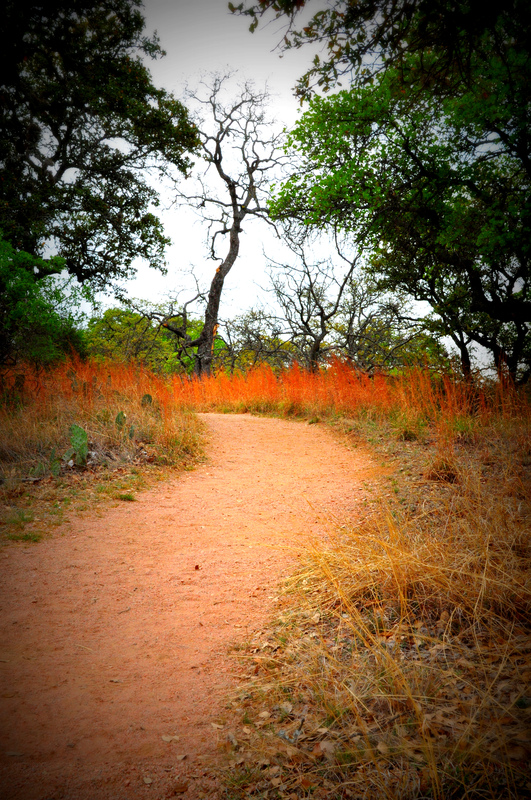 It is a Texas state park located 15 miles to the north of Fredericksburg. And apparently – according to wiki – the large rock is called a monadock; meaning a lone hill (or mountain) rising out of the plain. 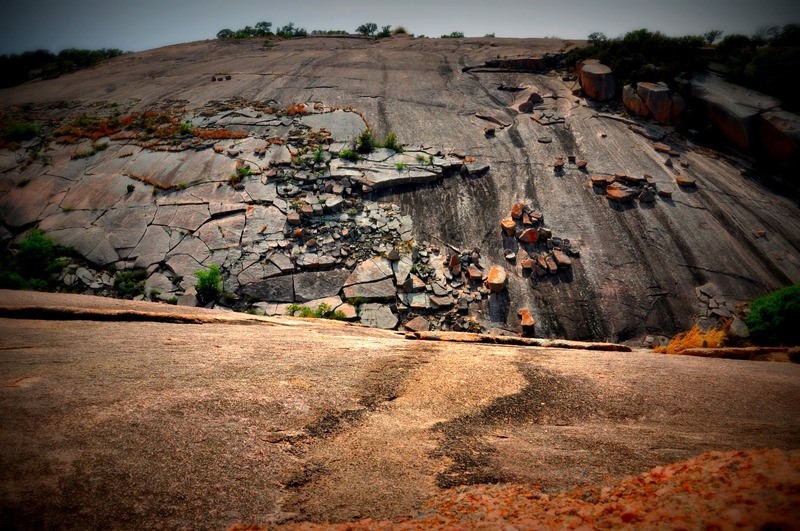 It is recorded as the largest monadock in the United States. 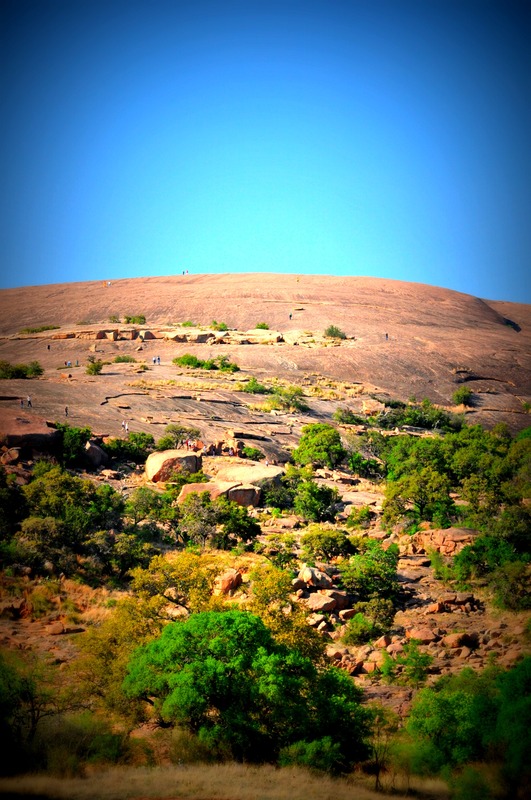 The Indians used this word and that explains a lot about Enchanted Rock. There are MANY stories and legends very spiritual in nature. It’s been said the minerals in the rock are renewing. It’s been said if you stay the night there you become invisible. 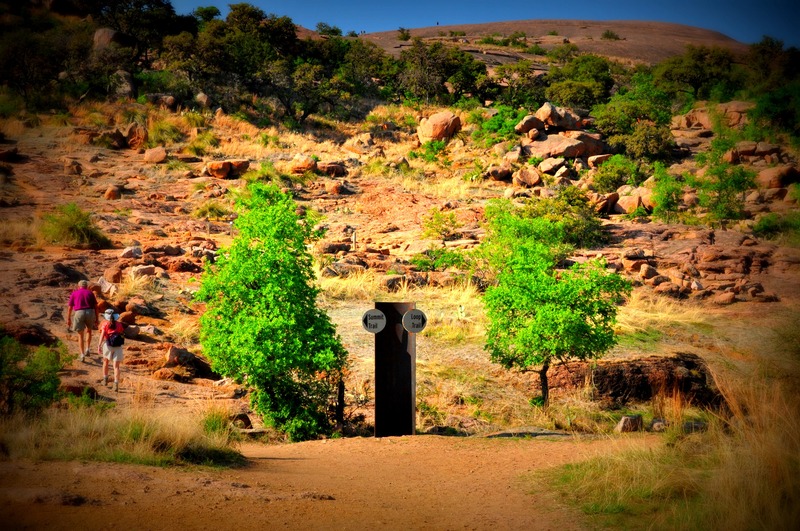 The natives revered it as a holy portal to other worlds. I don’t know about all the legends, but I do know it caught my attention. 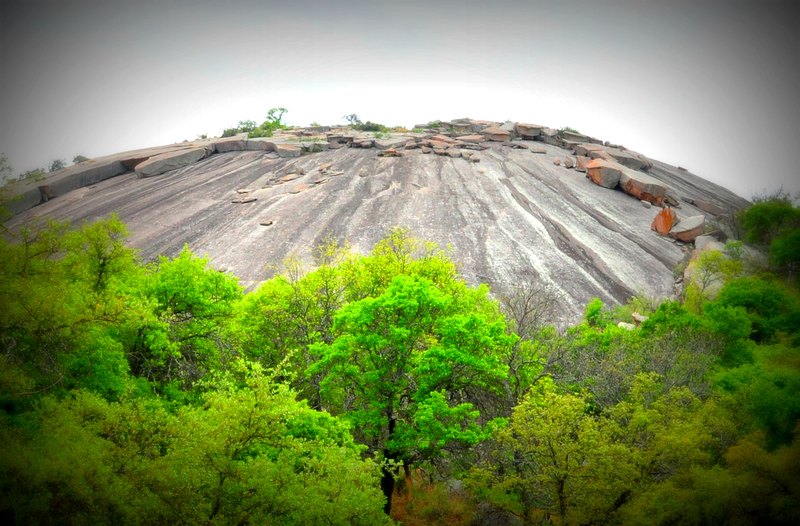 Not just the monadock of Enchanted Rock but the whole area. The feel of it, the colors, and the peace that radiated. The utter fascination reminded me so much of Close Encounters of the Third Kind. I couldn’t stop staring at the “rock”. I wanted to grab some clay or mashed potatoes; mold it, sculpt it, and remember every detail. But instead, we did what any budding photographer(s) would do. 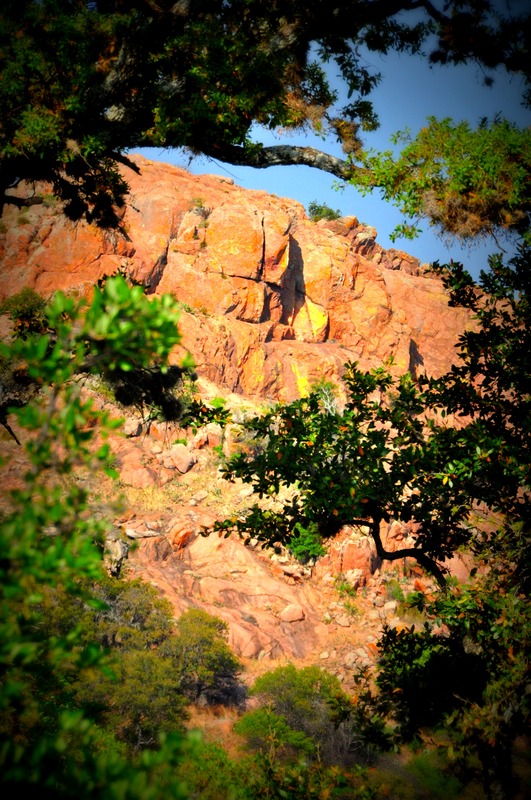 Took the scenic route around the rock – better to see you with my dear – and not just climb straight up. The Loop Trail was our path to begin with. 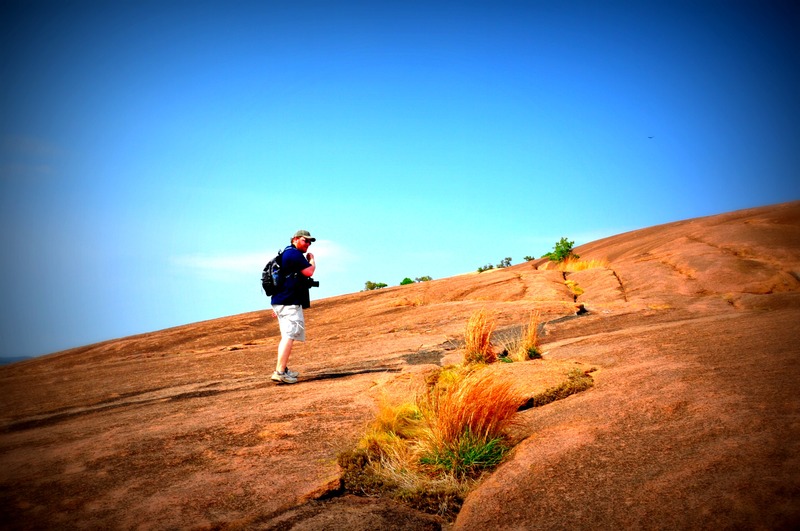 The loop trail takes you between Enchanted Rock and Turkey Peak. My sights were equally torn between the two. There were people on Turkey Peak as well, but the climb looked much, much harder (for another day when we are more fit?). I fully expected a rough climb right away, but it wasn’t. 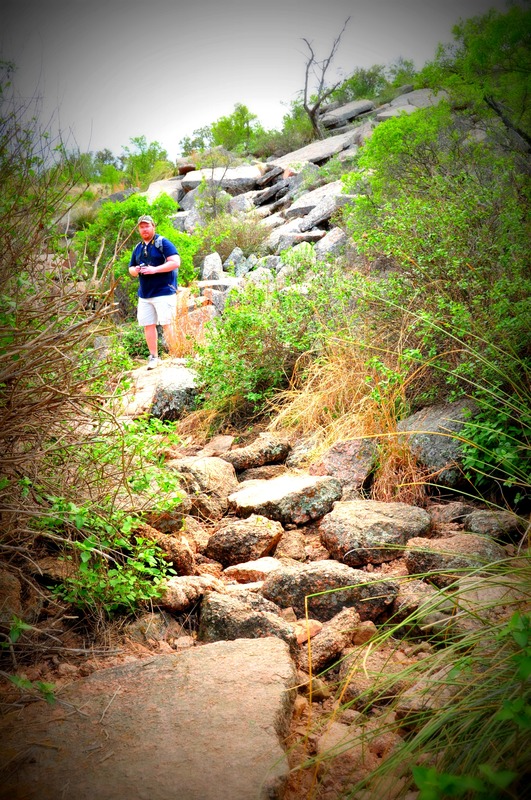 There were big rock stairs and a nice wide path. The ascent on this side was very gradual. The scenery as beautiful as I expected. The loop trail (we took half the loop trail) did not disappoint in all the sights of the two peaks and great landscape. 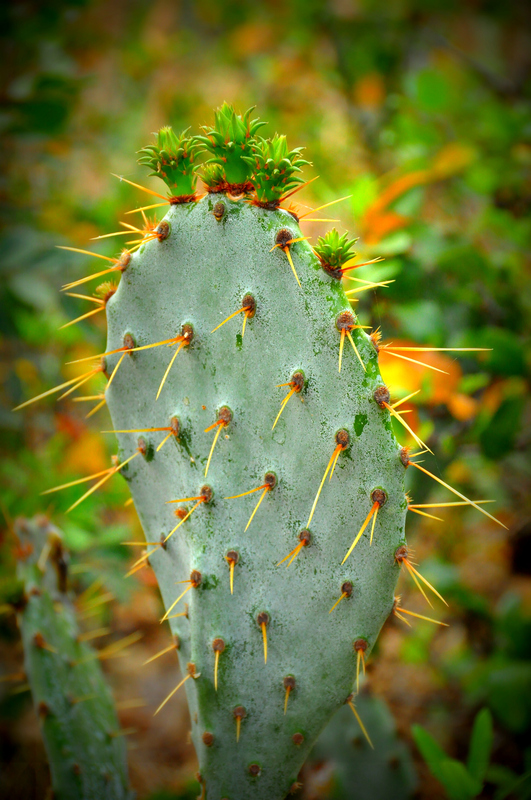 There were soooo many cactus, but they decorated the grounds perfectly. The area was very dusty and dry and they seemed a natural part (which they are). Some of them were in full bloom. 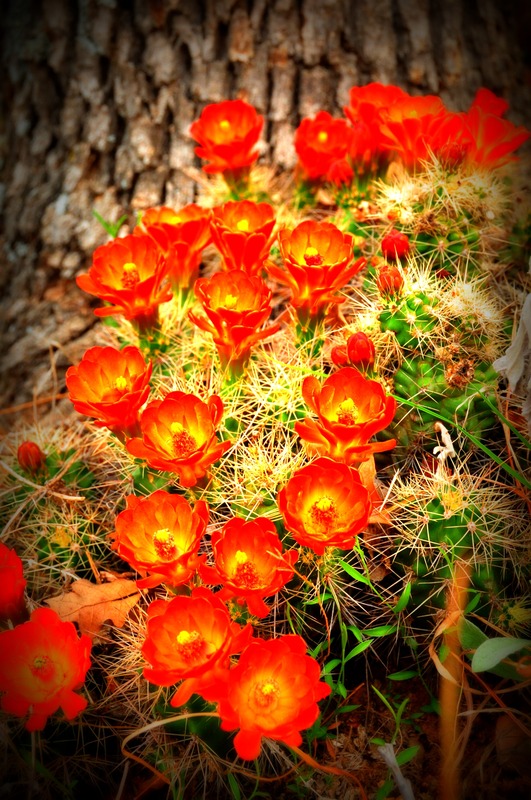 I had no idea dull prickly cactus had such gusto and vibrancy in them. 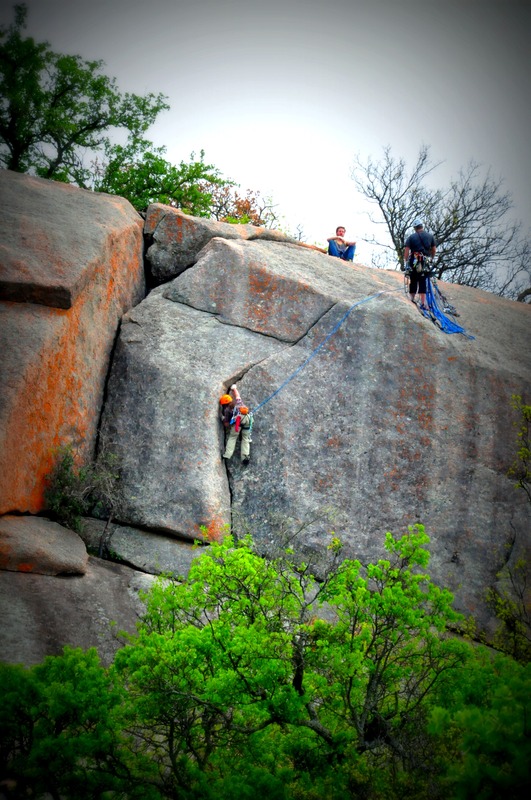 Around the bend we discovered……..
Crazy adrenaline-rushed maniacs rock climbers hanging from a cliff (ZOMG!). And I kid you not, about four vultures circled in the immediate area. Coincidence? I don’t think so (shudder). Of course the hikers let out quite a whoop when the guy made it to the slanted narrow rock face they sat precariously perched on. Ummm, yay? 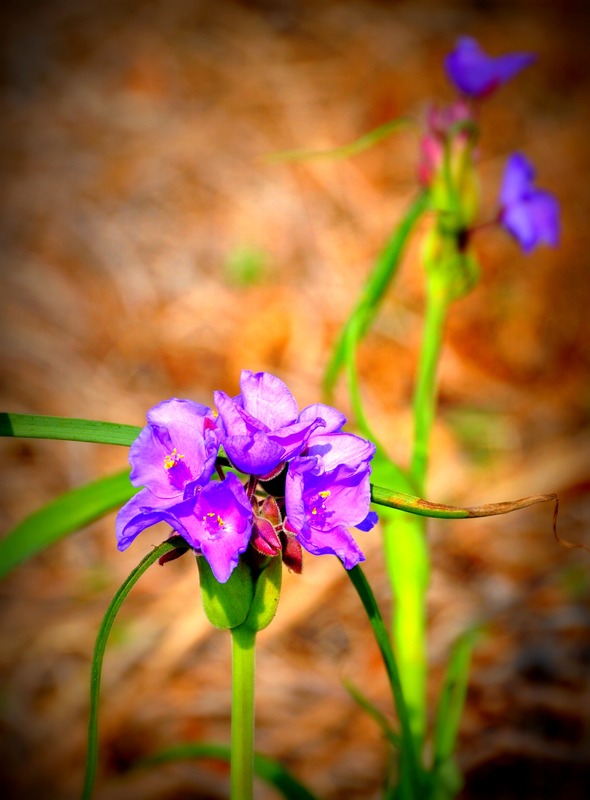 The next part of the trail goes from scenic – look at the pretty flowers – to ugly in about twenty steps. No more lovely curving paths peppered with pretty cacti. Oh no, it gets rough. Enter Echo Trail path. I think they call it that for the screams and scrapes from climbing BOULDERS. This is not a path it’s a death trap. I was wearing sneakers and shorts. 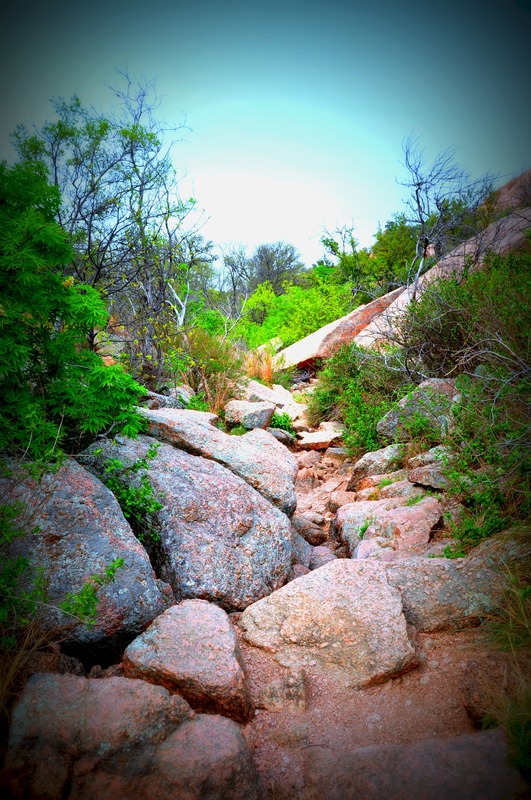 I was terrified of snakes under rocks (that’s where they live, right?). But hey, you know what? I grew up with two brothers close in age. I used to climb trees for fun. I faced a snake or two and lived to tell about it. My husband, the former Marine, with nerves of steel is waiting. 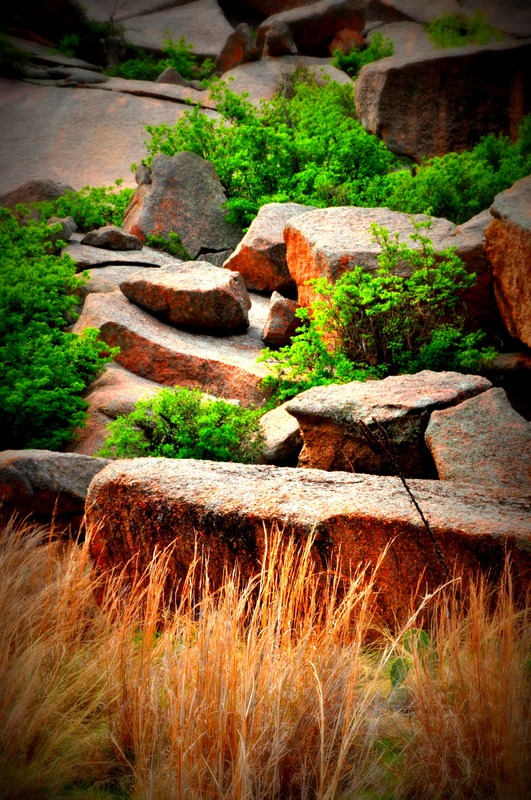 The boulder way seemed a short cut to the top. After the vigorous slab hopping, we ended up within sight of the peak. It became clear to me there was only one way to go from this point. Up (pic above). I wanted to go up. I did. Every part of me wanted to be at the top on a very FLAT surface. Just something even to stand on; not a slope or a slant. Ohpleasefortheloveofallnature get me down. Whimper. But I had to move my limbs UP to get there. That’s when I had my first panic attack of all time. The full-blown can’t look down – can’t go up – legs turned to jello heart-thumping kind of panic attack. Jason smiled from high above, “It’s okay. You can do this, just lean into it. It’s not bad.” Then he pointed out the 11-year old girl walking up the side of the mountain with her parents and younger brother. Casual-like, in fact…. almost running skipping up the side. That’s when I pulled out all the stops, not that I wasn’t scared, but I wasn’t going to let Jason continue to smile and move his eyes in the direction of the CHILDREN pouncing up the granite surface in a hop-scotch-kind-of-way as he so casually stood way, way above me. Did I mention he was smiling? Fine! I put my head down and I climbed. Eat your heart out Miley Cyrus. I made it. I leaned. I dug. I took several panic breath breaks to get there. We went down via the Summit Trail – the one at the beginning that we skipped. I’m really glad we didn’t go up that way, because the sight of this rock face would not have bode well with me and my jello legs. The trek down was just as hard, but if you walk in baby steps. Stop often, and choose a diagonal zig-zag path, it’s not so daunting. Just be careful of the children racing by. The best part of the whole trip….I wasn’t even sore the next day. Four hours of walking and climbing a mountain of stone by an out-of-shape middle ager suddenly fearful of heights. Yet, I still left the rock energized, accomplished, and only scraped on one knee. 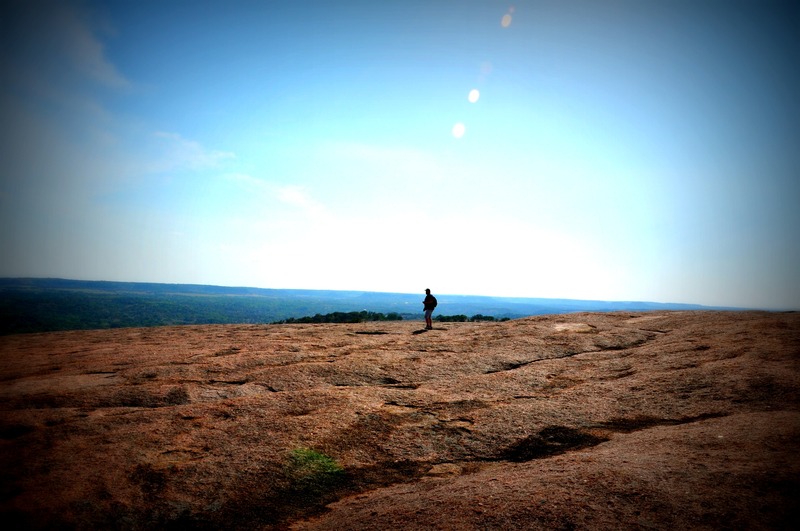 Enchanted Rock? Definitely enchanted me.